The ecosystem of Microsoft has always been Windows platform, and thus Office for Mac is one of the few rare software application developed by Microsoft for Apple Mac OS X platform. Office for Mac 2011 is the latest version of Office productivity suite for Mac OS X system, which has since been officially released to retail shelves on October 26, 2010. A good news to subscribers of MSDN (Microsoft Developer Network) or TechNet is that the final RTM version of Office for Mac 2011 is available for free download on Subscriber Downloads, together with free product keys for activation. On TechNet, Office:Mac 2011 is available for both Microsoft TechNet Subscription Standard and Professional plans. The SKU or edition of Office for Mac 2011 that available for download on TechNet and MSDN is full fledged version of Office for Mac Home and Business 2011 with all the Office 2011 for Mac features available, which retails at $199.00 and contains Word for Mac 2011, Excel for Mac 2011, PowerPoint for Mac 2011, Outlook for Mac 2011, and Messenger for Mac 8. The ISO is a DMG wrapped in an ISO enclosure package, and must be opened and used on a Macintosh system. 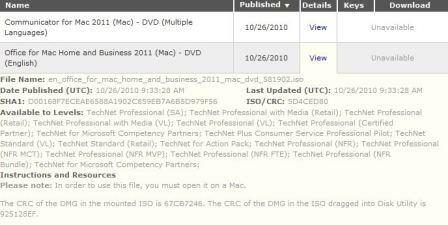 Note that the Office for Mac 2011 from TechNet and MSDN can be of volume licensing (VL) or retail channel, where for retail version, a product key is required to install the application. If you want to download the Office for Mac 2011, but does not any MSDN or TechNet subscriptions, just download the leaked ultimate version of Office for Mac 2011 (Office for Mac Standard 2011), which includes Word 2011, Excel 2011, PowerPoint 2011, Outlook 2011 which replaces Entourage, Messenger for Mac 8, Remote Desktop Connection for Mac, Document Connection for Mac, and Communicator for Mac.